Brrrrr its cold in here…. Did you know you can now get Nespresso compatible pods/capsules that allow you to make ICED coffee using your own Nespresso machine. ICED coffee is becoming more and more popular each year. Since Starbucks made their Frappuccino everyone loves a nice cold coffee and McDonalds have just brought out their own ICED range. The only issue with all of these is the cost. For the price of one drink you’re looking to spend at least £2/3. Using Nespresso compatible pods you can buy a box of 10 for around the same price as you would pay for one drink at a well known store. 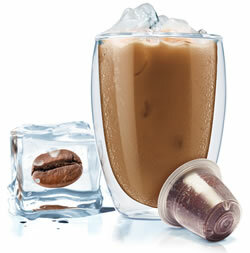 If you could make an ICED coffee at home, would you? The answer is yes, you would. We all would, especially if we had a machine that makes regular coffee using Nespresso compatible capsules why not use the same compatible capsules for a refreshing ice cold beverage. Were calling it Nespresso ICED coffee, you should give it a try whilst were still in the warmer months, because before you know it you’ll be sipping some of our Nespresso compatible hot chocolate pods again in front of a nice warm fire.